I've never been a massive fan of glitter. A little bit of shimmer here and there but I've always been a matte kinda girl at heart. 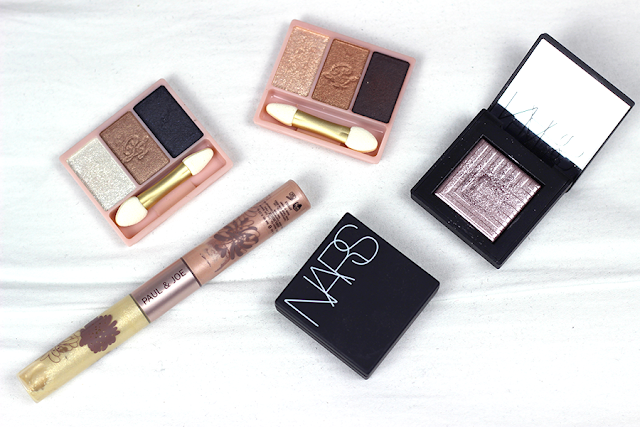 Enter these beauties from NARS and Paul and Joe Beaute, and everything changed. Just like that. Another favourite are the NARS Dual Intensity Eye Shadows in Callisto* and Dione*. Perfect glittery shadow-ness. That's all I need to say. Read the post linked for all the deets on these beauties and of course some unmissable swatches. They're a goodn' and a firm favourite in my collection that I just can't imagine not using. I'm actually so happy I've gotten into these and can only imagine this obsession and collection will be ever growing. What are your favourite glitter products? I'm definitely more of a matte girl, but I do agree Christmas is the perfect time to add some shimmer :) those Paul and Joe palettes look so cute! I have never tried Paul and Joe products but I have been eyeing them on Asos for quite a while. They're often on sales. Glad to know they're good quality! I love everything glitter and for eyeshadows, I love those from Dior and Urban Decay.